If you’ve heard of “open” MRI, you know that while the name seems inviting, they tend to be open on the sides but with a gap that is quite narrow. The top plate is right in front of your face. You may also have heard that the magnets used in these systems are quite weak, which results in poor image quality. In fact, the average “open” MRI scanner has a magnet-strength of only 0.3T. Industry standard for high field imaging is currently 1.5T—quite a bit stronger than 0.3T. This is the strength of the average MRI scanner at a good hospital or imaging center. The strongest magnet used in MRI scanning is 3T—ten times that of the average “open” MRI. 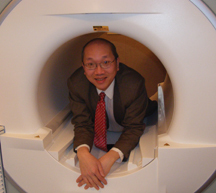 When Dr. Chao decided to expand the practice to include an MRI scanner specifically designed for people who were either claustrophobic or “of a certain size,” his research pointed to a scanner made by Siemens, the Espree Open Bore 1.5 MRI. It had the advantage of being as strong as any “closed” 1.5T MRI used at most hospitals. It is also the most spacious MRI scanner available. Even better, the Espree he selected was one that has 18 channels—which adds even more strength and better image quality! (a bit like a souped-up sports car) When making the final decisions as to new scanner options, we made sure to include software called “BLADE Motion Correction.” As you know, you have to remain perfectly still when having an MRI—not easy to do when you are in pain (or are anxious about your test). BLADE compensates for slight movement, giving sharp pictures without having to repeat certain ones that are blurry due to motion. Patients have a choice. A prescription for an MRI is very much like a prescription for antibiotics. The patient decides where to fill the prescription. Given the importance of an MRI for possible surgery and diagnosis, it is worth taking the time to do a little research to make sure you are going to an MRI provider with good equipment and also to find out which radiologist will be “reading” the image. The report the radiologist writes is VERY important. Best Open MRI is interested in providing state of the art MRI in the most comfortable setting possible. While our scanner does have a round opening, the opening is 70 cm across—nearly 30 inches! The top of the magnet is farther away from your face than any traditional “open” MRI. Also, the Siemens Espree is the shortest magnet available. Your entire body will not be in the scanner. 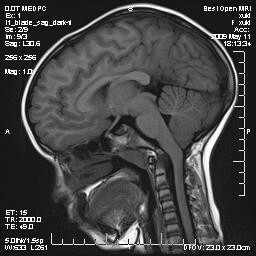 In most procedures not involving head, neck or upper spine, your head will not even be inside the MRI scanner. And, if we are doing a study of your lower body, like a knee, you can watch a DVD on our 52 inch flat screen TV installed in the ceiling! With its larger bore-size and stronger magnet, our “open” scanner is well-suited to meet the needs of all MRI patients, but particularly those with special needs such as obesity (up to 550 lbs), claustrophobia, and anxiety. In addition, with the gentle nature of this MRI procedure, pediatric and elderly patients can benefit. A mother can hold her child while he or she is inside the magnet; a daughter can hold her mother’s hand. We have been offering breast MRI at 3T for 7 years. Breast MR at 3T is 100% sensitive for breast cancer; Breast MR at 1.5T is 90%. When a Breast study cannot be done on our 3T, we are able to do these studies at 1.5T on our OPEN BORE magnet. As mentioned above, our Espree is the widest and shortest MRI scanner and we use an 8-channel breast coil. Something else to consider when selecting an MRI facility is price. In this day and age, many people either do not have insurance, or have very high deductibles. To help with this problem, we offer a heavily discounted out-of-pocket price of $500 for a non-contrast study; $700 for a study with contrast. Also, for patients with high levels of claustrophobia, we are able to offer IV sedation for a $50 surcharge. Even having the most OPEN MRI, some patients require IV sedation for the test to be completed. Ask your MRI provider if they offer IV sedation. We have done so safely in Delaware since opening our doors in 2007. IV valium is safe and effective and allows patients to have the benefit of MRI without the fear of being inside the magnet. Claustrophobia is no longer a problem for the patients of MRI Consultants or BEST OPEN MRI. Next Story → What Do They Have In Common?